This has been a very busy month for me. We leave for the beach early Sunday morning. After a week there, we will travel to Ohio to pick up our new puppy. We can't wait to see Emma. The breeder is the best ever. She emails me with pictures of Emma and keeps me informed of her health. I always pack so much to go to the beach. Chairs, umbrella, hats, suitcases of "what if I need this?" stuff, etc. But it's all neatly packed and ready to put in the car. We also had to pack extra stuff for Emma. Can you tell I am excited to bring her home? I know it will be extra work, but worth it. I have been talking to Taylor (our cat) about Emma and she assures me she will love having a sister. They even have matching collars. I plan to gather lots of beach treasures as the ocean gifts it to me daily. 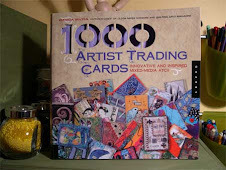 It's great to use on quilts and on quilted books. It's also great exercise to walk along the beach and pick up the shells. I hope to have a lot more quilts planned when I return. I'm taking my sketch book and camera. I do hope we have wonderful weather. The last time we went, we had to leave early due to a hurricane. 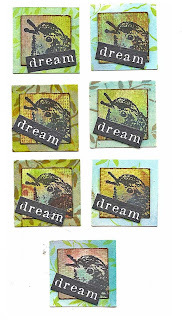 I just finished making this new set of inchies for a swap. It is mostly all done using pigment or dye ink. I used a 1" and a 3/4" punch this time. It really saved a lot of time. I use to cut them all by measuring with a ruler and using a rotary cutter. You wouldn't believe how many I threw away from not quite cutting it straight. Now, it's just a simple punch! 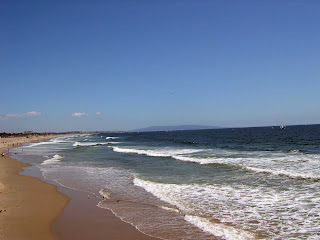 I have been making a list of what to take to the beach when we go on vacation in 10 days. Our hotel room or I should say beach bungalow has a full kitchen so that makes it easy for us to cook our meals. One thing we have found out is that vegetarian meals are hard to find in lots of restaurants near the ocean. So we take extra cooking items. I love the big rocking chairs they have on the deck outside each room. 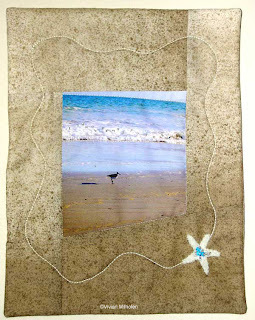 We love to sit there at night watching the ocean and listening to the waves. Here is a recipe that I will share with you that is so easy and yummy, too! Cook the veggie sausage slices in oil, flipping to brown a bit on both sides. Add the peppers, onions and basil. Cook on medium heat, stirring until veggies are a bit tender. Here's how I make it: I steam one package of frozen cauliflower until tender. Use the spray margarine...spray 6 sprays into the cauliflower. Add a bit of Fat Free half and half cream. Whip with a mixer. (I use a hand held blender). You won't be able to tell the difference in this and potatoes. This is a picture of my latest creation. 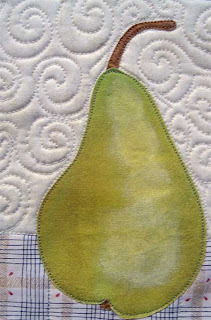 I used the painted fabric (Setacolor) for the pear. Then, I used some acrylic paint to add a few highlights. I wanted this piece to be a bit nostalgic, thus the check print at the bottom. The border fabric is by Lake House. 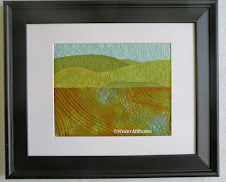 I also have it in green and I really like the whimsical look of the print. The size is 8 1/2" x 11". 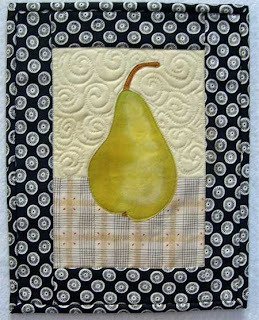 I may be into a series of "pears" now. I think I will try a techno one next. It is 102 degrees here in the DC area today and our upstairs air conditioner went out. It is now thankfully repaired. This is what I am obsessed with this week. 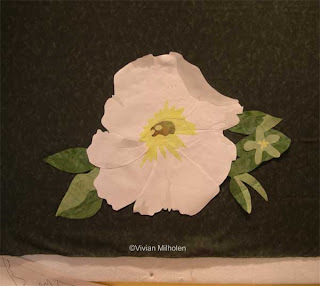 This is my WIP of the flower quilt I am making from a photo I took in my garden. This is only the beginning...no stitching yet, only a preliminary layout on my design wall. This one is very intriguing to me. I've already had to paint more fabric (the gray) for shading. I think the fun part will be when I start to quilt it and add the machine embroidery for details. This quilt is larger than most of the ones I do lately. There are two more flowers and leaves to add and a border before I'm done. Should be fun! We went shopping last night at Petsmart! We bought Emma a collar and leash with white bones on a red background. And we got her a red comfort harness for walking. They had soooo many pink collars (and she may just get one of those, too) but I thought the red would be cute. I'm not sure her dad will want to walk her with a pink leash and collar...LOL! We can't wait to get her! We got a nice crate (kennel) for her. We already have a sweet pink bed that has"Princess" on it. Scroll down the page if you forgot how cute Emma is! I have to make her a quilt, too! I did look for cute puppy fabric at G-Street fabrics but they only had a few choices. I bet I have some here from the days I worked in the quilt shop. Thanks to everyone for the nice comments on my blog. I wish Blogger would let me reply to each of you, but alas, it is not to be. But I do so appreciate the comments. Back to the design wall and I have a berry dessert in the oven (made with oats, brown sugar Splenda and butter.) Yum! It's such an easy dessert.